It seems like every year there are more music festivals than the last, and I've been to Lollapalooza, but Coachella has always been on my dream list. 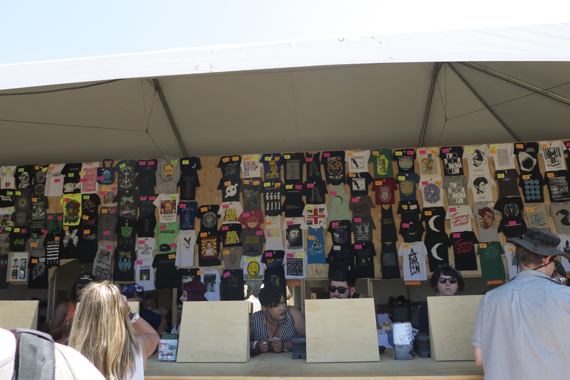 It's got a bazillion bands each year, and that intangible California cool. Regardless of who was on the lineup, my middle school/high school bestie Emily and I decided this would be the one year of our lives we'd check it out, since Emily is currently living in Yuma, Arizona, just a few hour drive away. We managed to purchase tickets and I couldn't believe this was actually happening. I had a few worries though: 1) that I would get horribly sunburned and get heatstroke in the desert, and 2) that the scene would be too Burning Man-esque. But neither ended up bothering me! 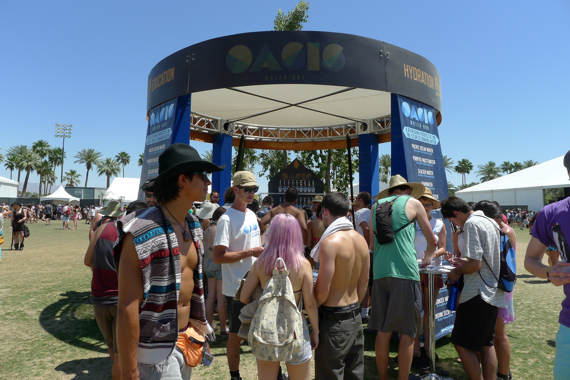 Here are our tips for music nerds who want to get the most music for their buck at Coachella. We were totally prepared — and that was all on Emily, I tip my hat to her. In fact, the first day we were so jazzed about the festival that I think we may have been the first ones out of 80,000 people to arrive at the parking lot. "It's not open yet," the parking lot attendent told us. "Can we wait?" Emily asked. "No," he said. "Go get a cup of coffee." So here are a few tips to surving Coachella from hyper-organized East Coasters. 1. Don't get discouraged if the website times out when you're attempting to buy tickets. It took us a zillion tries to get through, with both of us trying different browsers. 2. Bring your water bottle with a carabiner clip (as seen above). There are a few faucets scattered throughout the grounds. 3. A handkerchief is crucial for those who are prissy about sitting in the grass and dust. And it folds up to fit in your purse. 4. Tons of sunscreen is a must, but to my relief, a lot of the stages have metal roofs for some shelter from the sun. 5. The last day I rented a locker for $15 for the day, and it was a luxury to stash my jacket and a few other supplies so I wouldn't have to lug them around all day. 6. I loved following along on Twitter with @SPINfestivals — whoever is behind that is terrific. At the end of three long days outdoors, I didn't get even a hint of sunburn. That's a major miracle for someone as pale as me. And my other fear was my fellow concertgoers, but everyone was pretty docile. There was one moment where two guys near me exchanged words, and the first day at 11 a.m., a man staggered toward us then passed out cold, bloodying his face in the process. Poor guy. Other than that, all was well. They had two layers of security to get into the festival and they checked thoroughly. In fact, the woman administering the security check on Friday was disturbingly committed to her job. There was some cupping that I think went above and beyond the call of duty. Shudder. Above you can see the grounds and the shaded stages. This alien looking landscape behind Emily is all the art installations at Coachella. Let's see it! The Do Lab is that Dr. Seuss-looking thing. I really hope there was air conditioning for those guys in the hippo costumes. This giant snail thing looks innocent enough, right? It motored around the festival grounds, and I thought it was swell. Until it pushed its way to the front during the Divine Fits and Of Monsters and Men sets, relentlessly moving forward and practically trampling people to do so. We got so squished together in the crowd because of that stupid snail that Emily and I could've lifted our feet off the ground and still remained standing. You can plot the snail's progress in this photo series. After that, we didn't attempt to get close to the stage again. Thanks, snail. Picturef above: iconic ferris wheel, merch and screenprinting, water bar (people will wait in line to try different kinds of water, apparently), and fancy recycling bins that were uniformly ignored. They tried! I don't know anyone in the photo, but it captures the scene. I believe 40% of the men at Coachella had a variation of the Hitler Youth haircut. Pretty pictures of Coachella at night. That house on the left in the photo above was my favorite. It was all white during the day, and then projections at night made it look like there was a house party happening inside. Come back next time, and I'll talk about, oh yeah, the music! Posted in Music, Travels and tagged with Coachella, Concerts. May 6, 2013 by Adele Chapin.